Okay, bear with me because I'm about to tackle a pretty emotional topic - one that, in my experience, has become quite a hot-button, divisive issue in food and dessert circles. Yep, that's right. I'm about to talk about Red Velvet Cake. 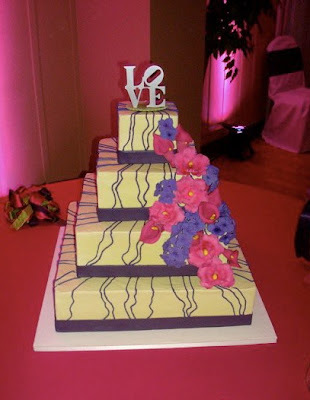 Part of this cake is Red Velvet! I don't know exactly when or how this happened, but Red Velvet Cake has become something of a phenomenon in the food blogging and restaurant world. My southern friends assure me this has always been the case, but somehow I seem to see RVC (yes, it even has its own acronym!) popping up all over these days. Places that were once dedicated to cupcakes, or the even more ubiquitous 'cake ball' (and its trendy cousin, the 'cake pop'), are now splashed with scarlet and liberally smeared with cream cheese frosting. A few months ago, I confessed that I'd never tasted this famous confection and, to be honest, I expected to occasion shock and incite rebellion. Perhaps I just have very well mannered readers, but I felt the deficiency nonetheless and decided I should make an effort to remedy it. My chance finally came at the wedding of my friend, Sara Beth (if you'll remember, it was during her bachelorette weekend in Nashville that my RVC secret came to light!). Here, they offered not one, not two, but three flavors of cake for friends to sample! There was a basic vanilla, an amazingly fudgy mocha chocolate chip, and, of course, Red Velvet. I know the food world is seriously divided on the issue of Red Velvet Cake: there are lovers and there are skeptics, and very few people in between. The lovers praise its unique flavor (thought I have yet to meet someone who can describe it!) and, of course, that gorgeous red, while the haters decry its gimmicky quality and the presence of masses of food coloring. Sure, the cake isn't as chocolatey as Devil's Food and it does require almost a whole bottle of Wilton No-Taste Red, but if this sultry southern dessert can make a convert out of Rose Levy Beranbaum, who am I to disagree? So how was that first taste? To be honest, I was really pleasantly surprised. I'm not a huge fan of regular chocolate cake, so I had few expectations, but RVC really delivered. I liked the slightly tangy quality (imparted by buttermilk and vinegar, I'm told) and the way it made the buttercream icing taste like marshmallows (yes, I know it's supposed to be cream cheese, but you can't put cream cheese icing on a wedding cake!) I liked the barely-there hint of cocoa - just enough to tease the tastebuds - and, yes, I even liked the scarlet hue despite the awareness that it meant downing dozens of E-numbers. I think the backlash against RVC comes from it being slightly overhyped (just like the people who now claim to hate cupcakes - how can you hate a cupcake, seriously? ), but I'm thrilled that I finally got my chance to try it - and you can bet this won't be the last time you'll hear about it on The Traveling Spoon! 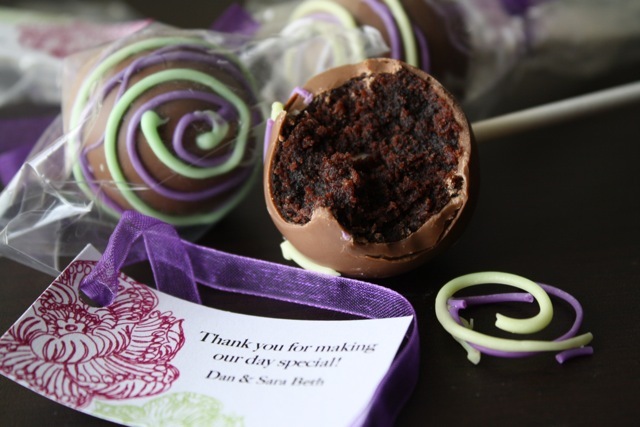 Just to prove how on-trend my friend Sara Beth is, they even had these gorgeous cake pops - made by the mother of the groom! The Mocha Chocolate Chip was pretty amazing, too! Lots of Food and Travel links!